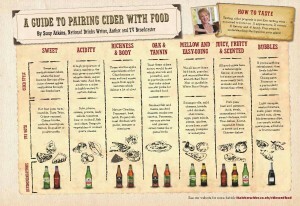 Fourth generation cidermaker, Thatchers Cider, has produced a new Guide to Pairing Cider with Food. Written by national drinks writer, author and TV broadcaster Susy Atkins, the Guide talks through the steps on how to recognise the characteristics in a cider that will make a perfect match with different food styles. The Thatchers Guide to Pairing Cider with Food not only demonstrates the versatility of cider when it comes to serving it with a meal, but also the characteristics that enhance tastes and flavours in food. She explains, “Cider is incredibly diverse and complex. Consider the many different apple varieties – bittersweet, bittersharp, culinary, dessert – and the very different styles created by our cider producers – dry, bubbly, strong, oak-aged, sweet. The Guide, which is available in full at www.thatcherscider.co.uk, looks at the characteristics of ciders, and then explains why certain foods work well.